"It was a kid in a candy store kind of story. Moving to Flagstaff from the San Francisco Bay Area, I just thought all the good rock had been climbed. Putting up routes at the Waterfall freed my mind. It allowed me to go and succeed on routes I otherwise would have never tried to lead at The Forks... All the dangerous ones." Over the course of some thirty five years, The Oak Creek Waterfall has quietly become one of the most concentrated selections of hard traditional climbing in the country. 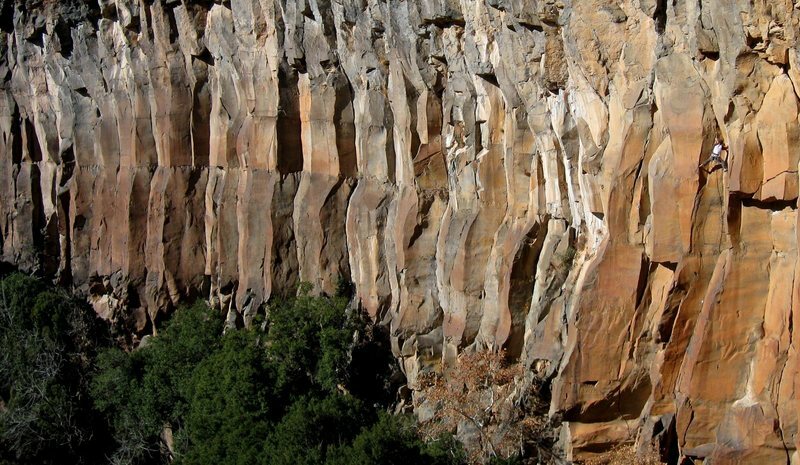 This broad columnar basalt amphitheater is stacked with splitter cracks and nervy gear protected face climbing. It is a powerful place which commands respect and is considered by many to be world class in the single pitch trad game. 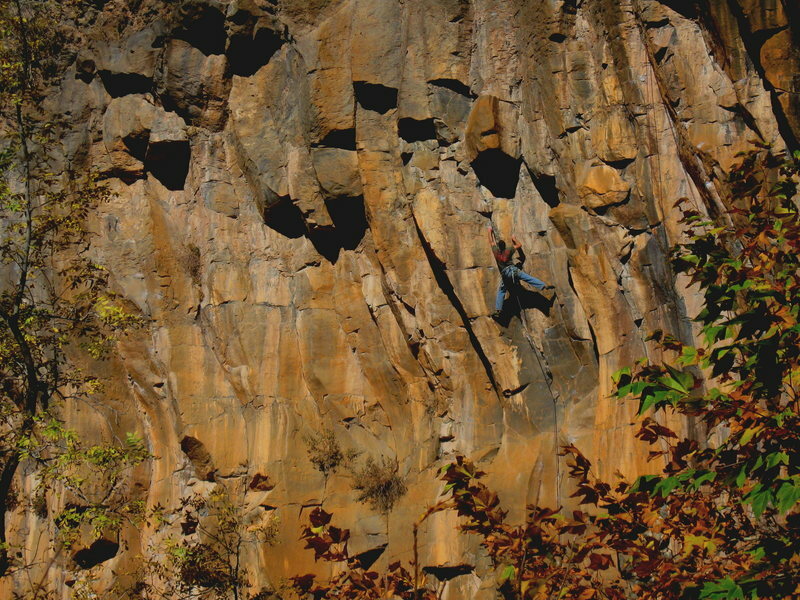 The Waterfall is home to over 130 trad routes on good to excellent basalt. Though there are a few scattered moderates, the climbing here really starts at solid 5.10 and there are 25+ pitches in the grade. Stepping into the 5.11 dreamland often brings thin gear, steep jamming, hard stemming, or otherwise serious cranking. There are 50+ pitches in the grade. The 5.12 climbing at the Waterfall is really special, and if you like the harder routes at Paradise Forks, then you are in for a treat here. There are 40+ pitches in the grade, many of which are plenty steep enough to log some flight time. On top of all that there is a generous handful of ominously thin 5.13 trad lines and the all natural gear line, East Coast Fist Bump, the first pitch here to be given 5.14-. 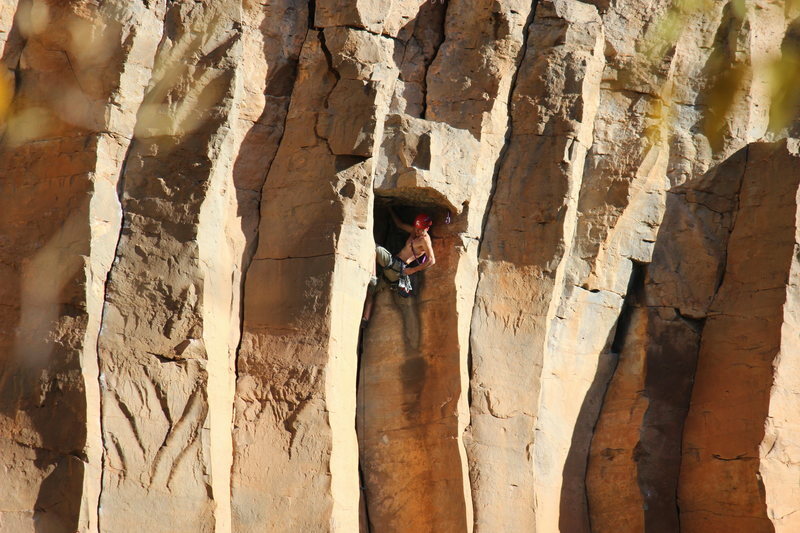 All this adds up to some of the burliest trad climbing in the greater Flagstaff/Sedona area, if not all of Arizona. Most of the lines stretch to one hundred feet or more. The crag namesake, pumping hard, spring 2010! 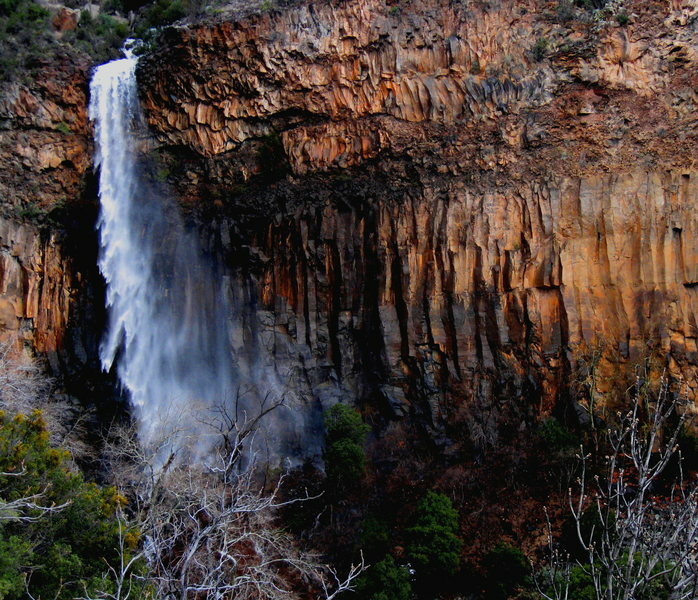 The first known route at The Waterfall was established by Tim Toula and John Gault in 1981 and called No Feelings. This somewhat psychopathic route still delivers a mental challenge to this day. In 1986 Tim teamed up with the notorious Stan Mish to establish the route Double Clutching which would also sport the first lead bolt at the Waterfall. However, the enormous potential would be overlooked as many of this generation’s best talent spent their time climbing the harder lines at Paradise Forks and bagging summit FA’s in Sedona. Jmo getting a piece in at the roof on the ever classic No Feelings 5.10+, Right Wall. In the early nineties a NAU grad student named Darren Singer arrived on the scene and took a good assessment of the place. 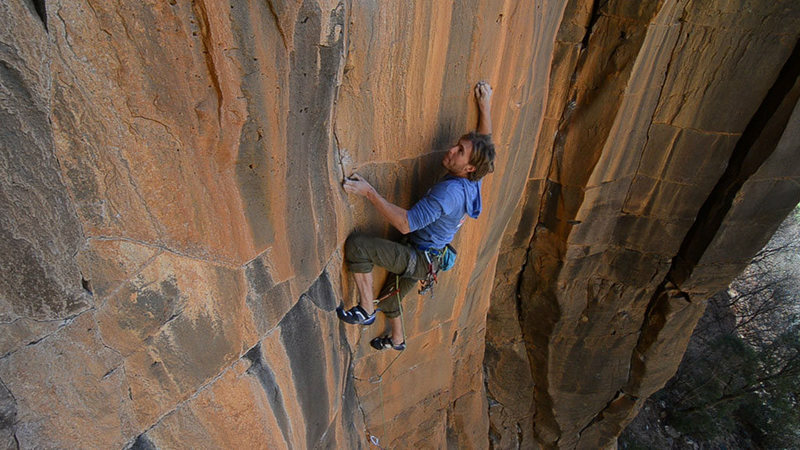 In the span of just a few years and with the help of Daniel Miller and Jason Keith, they established a good majority of the splitter lines on the Left Wall, as well as, some other well known routes on the Right Wall. It was a productive time with classic crack lines such as Black and Tan 5.10+, Spite and Malice 5.10+, Giardia Crack 5.11+, Locks of Dread 5.12, and The Terminator 5.12 were all opened up for business. A Most Excellent (5.11+) afternoon with Matt S., and The Left Wall stretching into the distance. It would be another ten some years before the next flurry of development. In early 2000’s, Dan Foster, JJ Schlick, and Seth Dyer started looking closer at the undone lines on the Right Wall. There they discovered positive edges, perfect solution pockets, and wavering thin cracks that all added up to some serious climbing of a more technical nature. Toe grinding classics such as Soldier Of Fortune 5.11-, Natural Enhancement 5.11, The Harder They Come 5.11+, American Ceasar 5.12, Full Steam Ahead 5.12-, A Wonderful Life 5.12, and Sweet Dreams 5.12 R, and more were all added to a growing list of burly routes. JJ at the last rest before the top crux of American Ceasar. Another stretch of years would roll by before JJ, Wade Forrest, and James Q Martin would set their focus on exploring the numerous undone lines in The Main Amphitheater. Fade to Black Would be the first route to penetrate the black section of the cliff. After this pitch was completed, it was obvious that any solid feature up this wall would be stellar, and so it was to be. A few of the modern classics include The Darkest Hour 5.11-, Dark Arts 5.11, False Prophet 5.11+, Death And Taxes 5.11+, Fade to Black 5.12, Pressure Drop 5.12+, and There Will Be Blood 5.12+. Dan Foster onsighting the second ascent of Death and Taxes. A timeless sports action pitch in the middle of The Main Amphitheater. From this parking area the crag can be seen up on the eastern side of Oak Creek Canyon. Clamber down through a well traveled notch in the cliff band to the creek. Boulder hop across the creek, then hike 30 seconds north, on the east side of the creek, past a short smooth sandstone wall. When the wall ends start looking for traveled paths through the shrubbery. There may be cairns, maybe not. Climb up well traveled tree roots and death blocks to gain the drainage proper. Hike up basalt boulders and after about 4-5 minutes there will be a very isolated sandstone bench. This is a nice place to stretch the legs. After this bench, stay in the main drainage navigating various obstacles until you are face to face with The Main Amphitheater. You will only get a few glimpses of the crag during the approach. 30-45 minutes. Google Earth Main Amphitheater. High water conditions can make it a challenge to cross the creek, and you may even find it unpassable at times, especially in early spring. 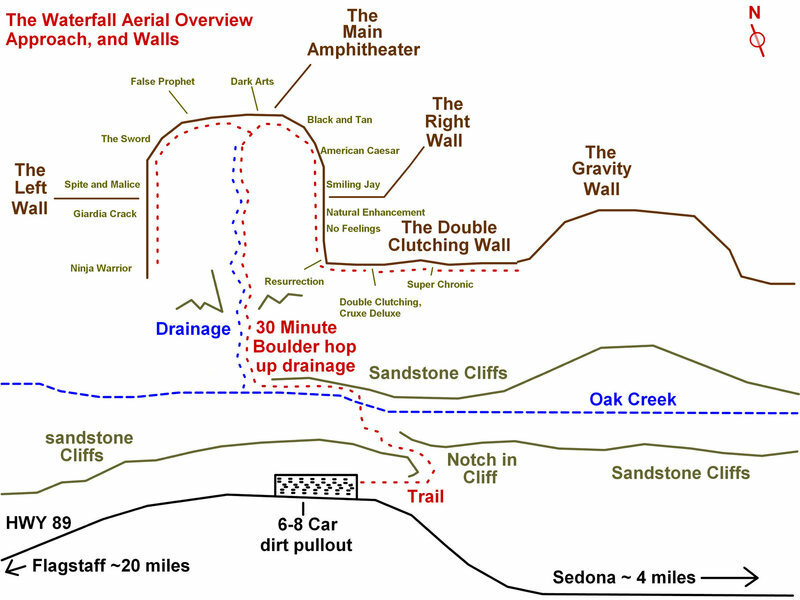 The layout presented here is a streamlined version, and a more in depth breakdown is given in the guide Sedona Rocks, Bloom and Wolfe. The approach deposits you in the middle of the Main Amphitheater. The Left Wall (which includes the Tombstone Area, The Pinnacle Area, and The Sword Area) is on the climber's left as you face the falls, and faces east. The Right Wall (aka The Fall Wall) is on the climber's right, and faces west. To get to the Double Clutching Wall walk two minutes down the Right Wall until you round a very conspicuous corner. The Gravity Wall is just a bit past the DCW. Like other crack concentrated areas, once you figure out where a few pitches are, it is relatively easy to locate the others in relation. A cool aspect of the area is that each wall has it's own unique flavor of trad climbing. The Left Wall boasts some truly amazing cracks. Be ready with fat racks, masochistic hands/fingers, strong toes, and a sense of adventure! This wall faces East and will get the first of the morning light. The Main Amphitheater is both intriguing and intimidating with it's bulging crown of steep rock. Many of the routes here are mixed pro, both gear and bolts, which opens up some spectacular terrain. This section faces south but does not get sun until midday because of the rim. The Right Wall is a mostly vertical collection of thinner lines with more technical cruxes. You can expect to find excellent crimps and gas pockets which make otherwise impossibly smooth sections of rock climbable. The harder routes on this wall require thin gear and the ability to place it well while on the run. The Right Wall also has several excellent warmups. This wall faces west so morning shade and afternoon sun. The Double Clutching Wall boasts the most amount of sun, and a slew of striking finger crack pitches. This south facing wall is a nice place to hang when the temps are on the cool side, and the winds are soft. This area also boasts the most amount of protection from random rockfall. Nick on Spite and Malice. The Waterfall area after a storm. The Left wall and Oak Creek Canyon! The base of the falls, spring, 2010. JJ, I'm sure I'll talk to you soon but I just wanted to speak up and say in this public venue that I find it quite disheartening that anyone that would frequent the Waterfall would demonstrate such lack of respect. I'm sure some online rabble rouser will try and make a statement about ethics, abandoned gear, or some other such nonsense, so let me try to head that off and say that if you're willing to climb a route that someone else has dedicated so much time and effort to you should recognize that such efforts are not completed in a day and to steal gear and tie ropes in knots is comparable to walking into an artists studio and destroying half painted canvases or smashing the unfinished marble block in a sculptors workshop. This is not a demonstration of ethics, more an expression of poor moral standing and selfish cowardice. To truly make a statement one should claim their actions and stand tall and confident in their views, rather than slink around behind false online monikers or anonymous theft and vandalism. Regardless of ones opinions on "bootied" gear I don't believe anyone could mistake a route in progress for stuck or abandoned gear. I for one find the theft of your gear deplorable and would like to use this online venue to thank you for all your hard work creating high quality, visionary, and highly enjoyable routes in multiple areas. I can only hope that this has been a misguided mistake and that the individual responsible will come forward and apologize. Again, JJ thanks for your hard work and dedication to widening the climbing opportunities in NAZ. Hey Jeremy and Crew! What a job you do as caretakers of such an amazing resource. I often wondered what the 'next generation' would do with this scarcely realized/appreciated destination. Though I haven't been there in years, it is still fresh in my mind. This place looks absolutely gorgeous. Sorry to read about the stuff getting lifted. As someone who also does FAs, I know how it is sometimes completely impractical not to sometimes leave fixed ropes up or stash gear. It is usually not at all a case of being disrespectful to an area or other users or a case of laziness. There is absolutely no excuse for somebody to steal stuff like that. Can someone let me know when the wall is in the sun/shade during the summer? Is it possible to climb some/any sections of the wall in hotter weather? Made my first trip to the waterfall today. Met up with Darren, Joel, Karie (sp? ), Eric, JJ, and Wade. Clay convinced me to make the trip up from Tucson. 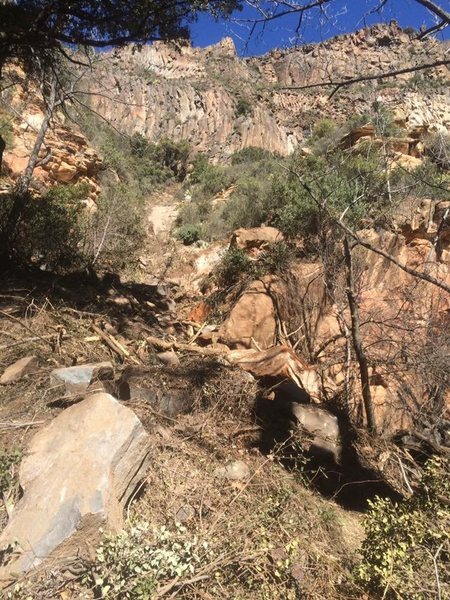 Went up earlier today and came upon a good-sized section of the approach trail (right before the last narrow sandstone canyon before the top) completely obliterated and covered by a large rock-slide that happened very recently. The upper-half of the approach has been pretty damaged and filled up, but it still goes. Don't get suckered up the rock-slide drainage even though it looks like a good path (we saw footprints going up it from climbers and hikers and they said it was horrendous). Also be aware of snowmelt and changing water levels during this time of year. When we hiked up in the morning, there was a mild flow going down the drainage. In the evening, there was so much water pumping through it covered most of the upper and lower trail and we had to bushwhack along the hill in sections which made for a fun adventure. After large snowfall, spikes in temperatures usually create high run-off which usually peaks once a day. (1) The quality of climbing here is ridiculously good. I'm not sure I've ever been to a place with such a high concentration of clean, sustained trad lines.